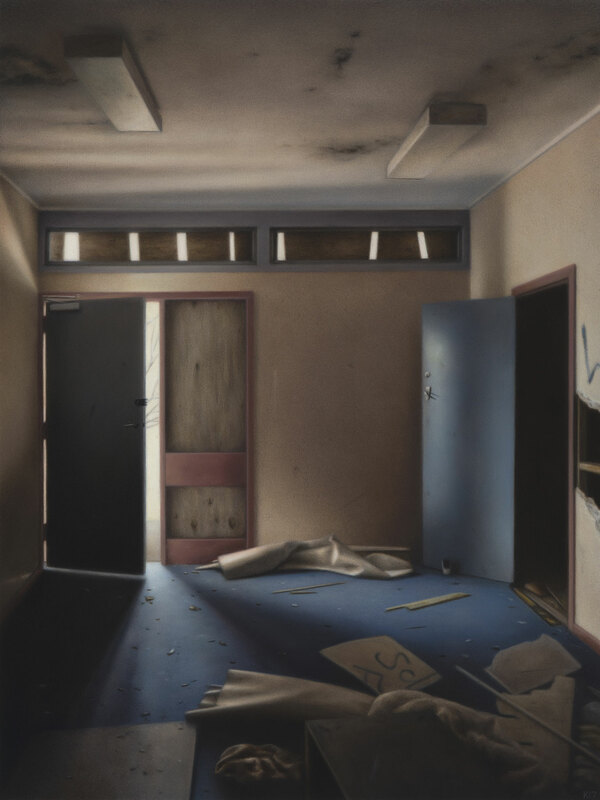 Kirrily Humphries is an emerging artist based in Canberra whose exquisitely detailed paintings take months to render. Using multiple layers of translucent oil glazes applied over time, Kirrily’s pieces become luminous with soft detail and subtle variations of light, shadow and colour. She says of her work; “I become quietly absorbed in the solitary exploration of architectural space. In my isolation I feel a heightened sense of physical presence, an amplified sensory awareness. The excited terror of exploring space forbidden or unknown intensifies this experience, presenting a realm for fantasy, anticipation and unfolding narrative. Based on my expeditions within contemporary ruins, I paint moments of sublime revelation, found in their distinct phenomenological and physiological experience. Informed by a single location, in these desolate interiors I confront my anxieties, my fears of destruction, and the transience and brevity of human legacy.” By working at a small scale, Kirrily encourages a similar immersive experience for viewers, impelling quiet contemplation. Kirrily graduated with a Bachelor of Visual Arts (Honours) from the Australian National University in 2016 and was the recipient of a number of awards and scholarships throughout her degree. In 2014 she went on an exchange program to the Ecole Nationale Superieure des Beaux-Arts, in Paris, France and has been exhibiting regularly since.